Government Ministers, Keith Scott and Winston Felix were absent from the National Assembly on Monday in keeping with a High Court ruling that found that they were elected members and could not sit in the House as un-elected/ technocratic members. 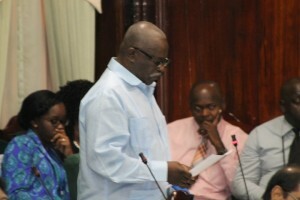 House Speaker, Dr. Barton Scotland told the House that Minister of Immigration and Citizenship, Winston Felix and Junior Minister of Social Protection would not be occupying their seats in the House. The decision was announced by the Speaker when the House resumed to consider the estimates of expenditure in the 2016 National Budget. Scotland said that apart from a copy of outgoing Chief Justice, Ian Chang’s ruling that was provided to him earlier Monday by People’s Progressive Party Civic (PPPC) front-bencher, Anil Nandlall, he had already opted to act based on reports in the media. Nandlall represented PPPC member Desmond Morian in whose name the court action against Felix and Scott had been filed. Minister of Immigration and Citizenship, Winston Felix. “I had determined as of yesterday that the information which was available in the newspapers was sufficiently reliable to depend on and the position is, therefore, that I can find no other way by which must respond to a decision of the court other than by respect and submission,” the Speaker told the House. Attorney General, Basil Williams said his government would always abide by the rule of law, but at the same time he hinted that the decision would be appealed for them to be “discharged and set aside.” “We will uphold the rule of law but we shall ensure that we shall leave no stone un-turned to restore our brothers Scott and Felix to their rightful places in this Honourable House,” he said. The House Speaker emphasised the need to unequivocally respect the decisions of a Court. “Whatever views may exist in relation to a decision of the Court at any time, the first obligation is to obey those decision and the proveed from there,” he said. The House Speaker said he has not been served with a Court Order but he was aware of the decision of the High Court.